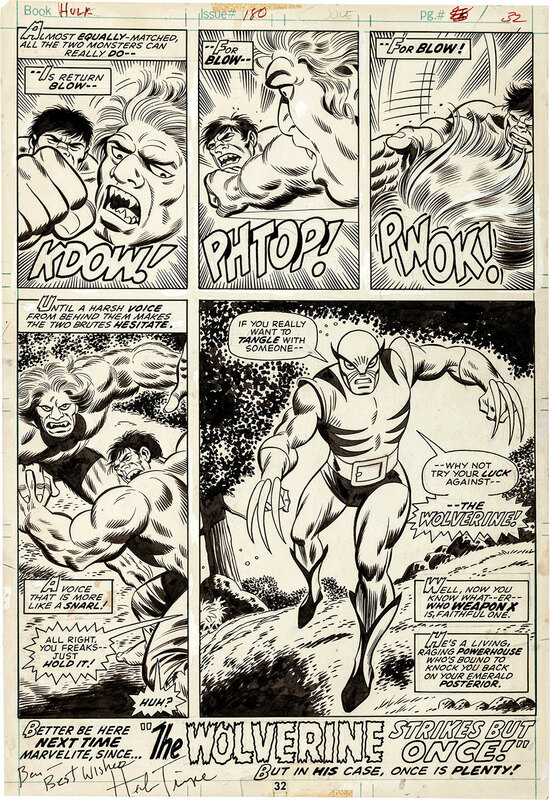 The original artwork featuring the first ever appearance of Wolverine, by artist Herb Trimpe, on the final page of The Incredible Hulk #180 (1974), arguably the most important debut of a comic book character in the last 40 years is up for bid at Heritage Auctions. In 1983, Herb Trimpe handed this art page to a teenager who visited him one afternoon as a souvenir of his visit. Think about that for a minute. Neither of those two could have imagined how successful the character of Wolverine would become, and it will be interesting to see how much this sells for at auction on May 16. The best part about this story is that the consignor, inspired by Trimpe’s own generosity, has agreed to to have the majority of the proceeds donated to charities including the Hero Initiative. I told you this was cool. I used to have the first print of this comic. Bought it out of a box of comics from someone’s attic who my dad used to work with which also included a…..WAIT FOR IT………Original Batman #2. Price of the entire box – Fifty bucks!